James Pinckney Henderson, the first governor of Texas. There is a gentle argument among the historically minded folk in San Augustine and Nacogdoches over who has claim to James Pinckney Henderson, the first elected governor of Texas. The dispute arises because Henderson maintained law offices in both communities. This might be a good resolution: San Augustinians went to the trouble and expense of erecting an equestrian statue of Henderson on their courthouse lawn and Nacogdoches did not. That, and good sense, ought to count more. 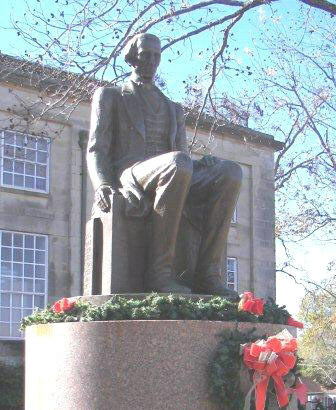 Henderson was born in Lincolnton, North Carolina, on March 31, 1808. After attending Lincoln Academy and the University of North Carolina he was admitted to the bar to practice law in 1829 -- at 21 years of age. He joined the state militia and rose to the rank of colonel before moving to Mississippi in 1835. That is where he caught the "Texas Fever." Henderson arrived in Velasco in June 1836, a bit late for the military phase of the Texas Revolution, but he joined the army anyway. His first assignment was to recruit Americans for similar service, which he did in North Carolina, and then was appointed Texas' attorney general and eventually secretary of state by President Sam Houston. Next came diplomatic service as Texas' minister to England, where Henderson married Frances Cox of Philadelphia in 1839. The next year they settled in San Augustine and Henderson opened a law office. In 1844 he joined Isaac Van Zandt in Washington to help negotiate a treaty of annexation, which was rejected by the US Senate. Good old-fashioned politics resolved the annexation issue more favorably for Texas within a year and Henderson was a member of the Constitutional Convention in 1845. He was elected governor in November, and became the first governor of the State of Texas in February 1846. Mexico and the US went to war that spring over annexation and other issues, so Henderson persuaded the legislature to allow him to take the field as head of the Second Texas Regiment and led troops in the Battle of Monterrey. Henderson resumed civilian gubernatorial duties late in 1846 but declined to run for reelection in 1847. Henderson returned to his legal practice until the legislature selected him as successor to Senator Thomas J. Rusk in 1857. He served only a few months in the US Senate, and died in Washington on June 4, 1858. He was buried in Washington, but his remains were moved to the state cemetery in Austin in 1930. But they have a fine statue of Henderson in San Augustine.That counts for something.